Hey guys, so I've been working a lot lately with restoration and rusticating. I made a standard rusticating tool, a group of sharp nails in a handle. I've been getting gorgeous craggy-style rustications. Very happy with it. My question is this, i've got a new pipe I want to rusticate but I want to replicate the rustication style of my Savanelli Long John. You can see in photos below this wasn't done with any sort of nail or screwdriver tool. It's not that craggy style. Appears to be more of a plethora of round indents. I really love this rustication. I'm thinking Dremel with bur bit. What do you think? It's certainly done with a Dremel motor and burr bit. The thing to remember in doing this is to keep the cuts random and nonuniform otherwise it'll look unnatural. quite uniform, they don't really appeal to me most of the time. If you've never done rustication, I'd practice on a scrap piece of wood or better an old useless pipe or piece of briar. Thanks for tips! Sadly I actually don't own a dremel yet, lol. I never needed one until I got into restoration, now it seems like the most addictive tool ever. I'll be picking one up today. Any ideas on where to get bur bits? I see some dremel come with round engraving bits. Googling "bur bit" brought up very little. Is there a more accurate terminology? If your going to purchase a Dremel I suggest you get the one with Variable speed so you can control it better and if you can afford it, also get the flex cable for more comfortable handling. Where ever you purchase one (Good hardware store, Lowe's, Home Cheapo, etc.) they should have the burr bits in stock also. The ones used on the Sav are obviously the small round/ball ones, I'd get two different sizes. Last edited by RP McMurphy; 05-24-2016 at 14:48. Where ever you purchase one (Good hardware store, Lowe's, Home Cheapo, etc.) they should have the burr bits in stock also. The ones used on the Sav are obviously the small round ones, I'd get two different sizes. "Honey we're out of paper towels..."
"Don't worry i have a paper towel attachment for the dremel.."
Can't wait to see the replication of that rustication! 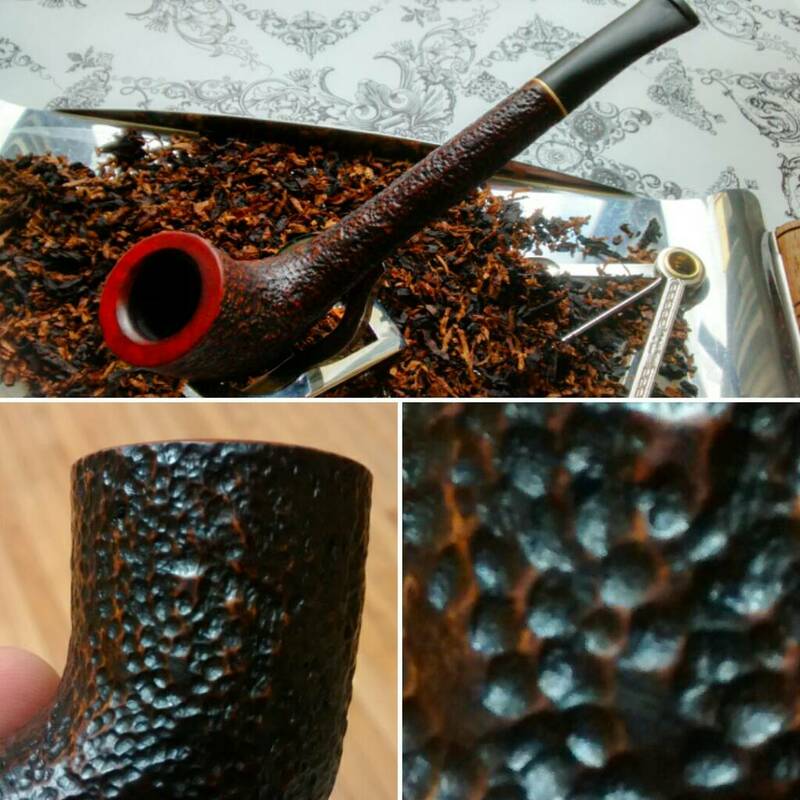 I "rusticated" many ugly, briar estate-pipes with rotary burrs, and turned cheap pipes into great lookers. Experiment on junk pipes for the wanted effects and staining techniques before you work on a pipe of value. Perhaps the traditional screw-tool and burr rustication = some wheel buffing combinations will do the trick. Do try all your carving magic on crappy pipes first, for no regrets. Good luck. You can, and will, do it. Last edited by BriarPipeNYC; 03-13-2019 at 12:07. I was looking at the pic of the pipe on which you were wanting to duplicate the rustication. It might just be my eyes, but it appears that there are patterns in the rustication that don't appear to be from the creator using a dremel type tool or similar. It almost appears that the maker used either a 2 point or 4 point rounded nub tool to repeatedly mark the pipe. As I look at the pic more, I am leaning more towards a two point as some of the indentations are close to overlapping the ones above. (see pic). If it were a 4 point nib tool, the spacing between all 4 points would be uniform. But the points don't truly line up to a 4 point tool. A 2 point tool though, and the golf ball dimples start to show the pattern. In the circled part, you can see in an couple of points on the pipe they pressed the tool into the wood and the spacing appears to be of a two point tool. It just seems like there is a uniformity to the size, depth, and distance apart in the dimples. Like I said, it could just be my eyes seeing patterns where they may be none, and as I have never rusticated a pipe, I am speaking from 100% guess. Sorry it turned the pic into an attachment...If you can't click on it, let me know and I will try and re-load it. Last edited by McGyver; 03-13-2019 at 15:39. Take care and check six! "If it ain't broke, you haven't tried hard enough yet"
Pipe Smoking - The next Extreme Sport - Where else can you take something that can cost almost as much as a car, fill it with combustible material, and light it on fire...for enjoyment! I can't see the picture, but from your text, this is pretty much my assessment too. The dimples seem to be in repeated pairs.